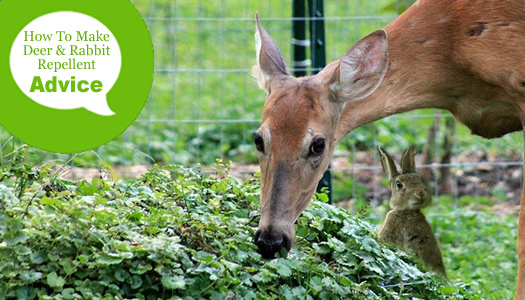 Though deer are heart-warming to look at in their natural environment, these creatures can do some serious damage or destroy shrubs, trees and other plants growing in our landscape and gardens. What was once love for them can turn to its opposite. The average deer eats about 5 pounds of greenery each day, and they'll eat just about any plant if hungry enough, which often happens during summer drought and winter when there is less to forage on in their natural habit: the woods. Animal repellents that work to ward off deer with unusual smells and tastes they aren't familiar with or don't like can be highly effective. That said, sometimes deer will become accustomed to the smell or taste of a specific repellent so you might find out that there's a need to switch repellents frequently to keep them away. With that in mind, here's some recipes you can use that have proven to be effective for repelling deer. You can make these non-toxic recipes easily at home. They will deter the deer, however, as with most repellents may need to be re-applied after a heavy rain. Mix one whole egg with a quarter cup of water and mix well. Pour the mixture into a pump bottle and spray it on your plants. This deterrent will withstand light rains because the egg sticks to the leaves. Mix one tablespoon of liquid dish detergent with one ounce of hot sauce in about one quart of water and spray directly on plants which deer have been nibbling. Zest Soap: A bar of Zest soap in a knee-high nylon stocking hung on a branch or bush keeps deer from eating your plant. Hair Samples: Ask your local hair salon or barber shop to save the cut hair they sweep off the floor every evening. Spread these hair clippings around plants deer eat. Plants: Bog Salvia (Salvia uliginosa) and Lantana plants do a great job repelling deer. These plants have a particular smell that deer hate! 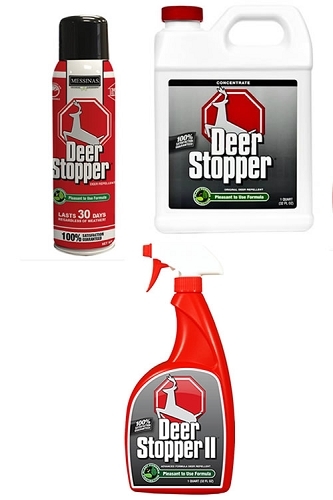 Nontoxic natural deer repellents are commercially available. The most effective deer repellent I've used is one made by Messina called Deer Stopper. Regarding a good rabbit repellent/deterrent. There are many repellent products on the market but very rarely do I see real good reviews on them. So I use a very simple homemade recipe that has proven to be quite effective, at least in my landscape and gardens. To make this rabbit repellent, first fill a one gallon container, such as a milk jug, with water. Crush 5 garlic cloves and add then to the water. Add a teaspoon of crushed red peppers and 1 tablespoon of dish soap. Shake the container very well and then place in outdoors in the direct sun for two days. This is to allow the ingredients to permeate the water. To use, shake the container well and then pour or spray the solution on the plants you want to protect from rabbits. Note: To use in a sprayer you will need to strain the solution through a cloth to remove garlic and pepper pieces that can clog your sprayer tip. Respray once a week and after rainfall until the rabbits change their pattern and find other plants that they want to munch on. Hopefully weeds or other non-desirable plants!